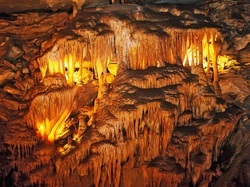 Mammoth Cave is best known for its cave tours. Some of the most famous routes include the Mammoth Passage Tour, which travels via the cave’s oldest entrance; the Frozen Niagara Tour, where visitors behold the beauty of that famous formation; and the Great Onyx Lantern Tour, which is led by lantern light. The park also offers plenty of camping opportunities – there are three developed campgrounds, and plenty of backcountry sites. Campsites include Mammoth Cave Campground, Houchin Ferry Campground and Maple Springs Group Campground. The Green and Nolin rivers border the park for 31 majestic miles and allow for many water activities like canoeing, boating, kayaking and fishing. Boaters can catch a glimpse wildlife, trees, plants and bluffs. Visitors shouldn’t forget to take a look from the Green River Bluffs Overlook, where a breathtaking view of the Green River valley can be taken in from high above. Mammoth Cave National Park is open every day of the year except Christmas Day. Visitors should keep in mind that fees for adult cave tours range from $5 to $48. Fees for campgrounds range from $12 to $40 a night. The park offers hotel lodging at the Mammoth Cave Hotel. The hotel offers accommodations throughout the park. The hotel operates three restaurants: the Crystal Lake Coffee House, a place for quick, casual fare; the Travertine Restaurant, a more upscale option; and TrogloBITES, a seasonal establishment for fast, to-go food. The park itself is home to over 70 species on the threatened, endangered or state-protected list. The pygmy shrew, a small rodent, scurries around the park and is one of the smallest mammals by weight on earth. Many of the park’s animals only come alive at night. Bats, for instance, are nocturnal and have been flapping around the cave system for millions of years. But their numbers are dwindling and efforts are being made to return the bats to their original population. The park is in the early stages of reintroducing river otter to the area. The first person to ever enter the cave probably visited more than 4,000 years ago, but it wasn’t until 2,000 years ago that Native Americans of the Early Woodland Period started using the cave for mining. These primitive miners searched the complex, dark systems for precious minerals. Traces of their past can be evaluated based on the objects they left behind: slippers, torches, mussel shells. In the 18th century, European settlers discovered the cave. They found the cave was abundant with calcium nitrate, which could be used to make black gunpowder — a precious commodity during the War of 1812. The cave’s worth increased dramatically and the settlers enlisted slaves to extract the substance. After the war, in 1816, interest in the cave as spectacle peaked, and there have been tours ever since. Since then, the cave has been used as a hospital, a choir space and a church, among other things. It was established as Mammoth Cave National Park in 1945. July 1, 1941 – Mammoth Cave National Park is established. September 18, 1946 – With the end of World War II, Mammoth Cave undergoes its formal introduction as the 26th unit of the National Park Service. October 27, 1981 – Mammoth Cave National Park is designated as a World Heritage Site. September 26, 1990 – Mammoth Cave National Park is designated as an International Biosphere Reserve. Click to see a detailed Mammoth Cave National Park map.